You can find the Friday Fill-Ins here! 1. It’s cold and and wet here lately…and I’d like a bit of sunshine, please. 2. I love fresh tomatoes. 3. My favorite health and beauty product is Biosilk Silk Therapy (for my hair…makes it oh so shiny!). 4. I could go for a a nice long ride. 5. Well, first of all I’ve been doing these fill-ins for quite some time and haven’t got sick of them yet. 6. He who shall not be named, a tall, skinny, pretty, blond chick willing to “be with” the aforementioned person in front of a bunch of folks I don’t know; those were the cast of characters in a recent dream and it was really very weird..
7. And as for the weekend, tonight I’m looking forward to a massage!, tomorrow my plans include absolutely nothing right now and Sunday, I want to do more of what I did Saturday! 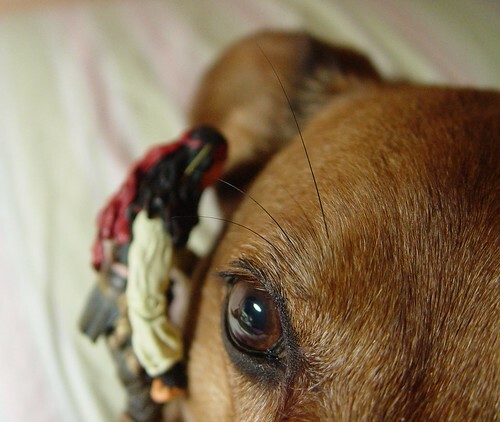 Captain Jack Sparrow whispers some secrets to Max…Max listens patiently and hopes for a dog treat! The massage sounds so nice! Max does look like he is really listening. I’m a biosilk fan too. Funny Picture! Doing nothing now and again is good. #5, I’m glad you’re not sick of setting them up! No one seems to be sick of filling them out! Our #2 and 7 were quite similar. Have a great “unplanned” weekend! I hope you get that much-needed sunshine today. We have some here and I’m about to go enjoy it. A massage? I am so envious. I’ve been wanting one for a while. Enjoy for me. Enjoy the massage!! I’m jealous! a massage sounds really good right now. i am super sore from hot yoga. it’s still cold up north? wow. if i could wave my faerie wand and send you sunshine, i would! Oh you so deserve a massage! Thanks for the fill-ins and love the Max photo! Max should have gotten two treats for being so attentive!! I am literally grinning from ear to ear because of the visual treat of the photo at the end!! Enjoy that massage and your nothing-much-planned weekend. Hahha that picture is too funny – love the caption. Hope you’re having a great relaxing weekend!